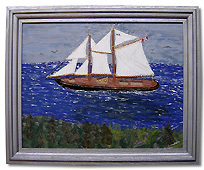 Calvin was discovered by Chris Huntington, who describes him as one of the few true folk artists still active in Nova Scotia. Calvin started carving after a serious accident in 1996. 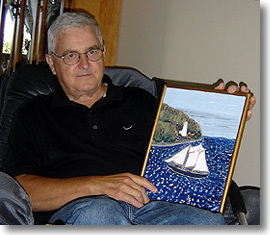 His favorite subject was Theodore the Tugboat but he also carved birds and fishermen. Calvin did not take up painting until 2004, but he soon developed his own unique style. Using carving chisels and a penknife, he carefully carves treelines, waves and other details (in some cases carving the individual shingles on the buildings) to create wonderful relief scenes which he then paints. 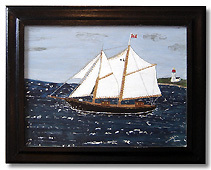 His favourite scenes are of local churches and harbours. Because of his health, Calvin can only work on his paintings for a few hours a day. 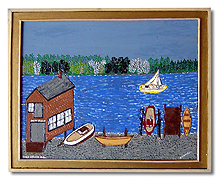 Many of his relief paintings take up to forty hours to complete. Click on image to enlarge and see description and price.